Change is good. Or is it? Over the past several years we've seen a major shift in what people refer to as "martial arts." Currently, MMA is in vogue, and already there are thick boundaries drawn between what is considered nouveau and the time-honored traditional martial arts. It seems TMA are no longer fashionable, as heavy emphasis is being placed on the combat effectiveness of an art, quite often to the exclusion of all else. Asian martial arts in particular have always been shrouded in a little mystery. Chi/ki-energy, mind control, and superhuman abilities are the stuff of urban legends and hucksters. With the advent of reality fighting all bets are off. There are no secrets. There's this place near my job that offers boxing, sambo, jiu-jitsu, the works. The area with mats is surrounded by a chain-link fence. In one corner of this school someone is working on a speed bag, while in another, basic self defense drills are taking place. This type of eclectic approach has become the norm, and I'm left wondering if becoming a jack of all trades is better than being a master of merely one. Is learning a hodgepodge of styles the direction that the martial arts are heading towards? Some of the old time masters forbade their students from cross-training in other styles, but the founders of many traditional systems did just that to develop their own curricula. Previously, I mentioned TMA as being "time-honored" but truth be told, the majority of traditional styles are barely a century old. Tae kwon do, aikido and karate - while they have ancient roots - were all formally systemized in the twentieth century. Judo, which was created in 1882, actually negated the nasty martial applications found in jiu-jitsu so it could be taught to school children and the proletariat. Budo, the martial ways, flourished during Japanese peacetime as a dignified and ethical pursuit of warriorship. Today, we can watch bloody cage matches on TV or YouTube. So much for evolution. Change is not always good, but for sure it's inevitable. Every "traditional" martial art was once the new thing on the block. Traditional Japanese Bujutsu, that is Koryu, is meant to be handed down EXACTLY a certain way. If a variation is made, a new branch is formed which is called a "ryu-ha." 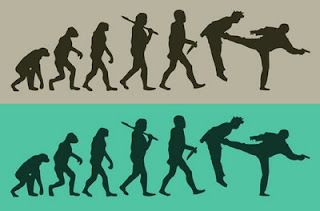 I think Chinese Martial Arts are meant to change. Each master seems to recreate the art for himself. The Wu style of Taijiquan I study has undergone significant changes in the last 150 years, but it is still distinctively Wu style. So if I read right, our mindsets haven't changed in a while. We came from wars, to training for wars, to training in the "Do" way back to training for war. To train in what ever fashion with out the connection to what most call civility or considerate conduct, i.e. the Way, which comes from the study of many classical works of which such stories as Lowry Sensei put forth. To practice with out this type of study is tantamount to disaster. Lets take the President-elect. He made a comment concerning his readings of Lincoln (classical text). Do we actually feel that if all he did was study politics that he would be who he is at this very moment? His reading list was one of the most important traits of his that caused my vote to be for Obama. Hmmm, to train the body with out the mind and spirit that connects us all is not a martial art, it is merely two animals going at it at all costs (I stress the "costs"). "We came from wars, to training for wars, to training in the "Do" way back to training for war." I personally think the capacity for violence is an aspect of human nature. Our violent tendencies as a species used to define us. But I believe we have an even greater capacity within us to transcend that. Cross training is becoming the norm now thanks to MMA. However if you take old style karate masters, such as Kanazawa, Enoada, Ohtsuka etc you will find that they also cross trained earning Dan grades on other arts. Cross training is a natural thing. As humans we always try to better ourselves or learn something new and limiting ourselves to only one martial art stops us in doing that. Its always best though to gain good solid foundations on one art before attempting another. The cage fighting and matches I see on TV while flipping through channels makes me sick. I just don't have the stomach for it. I'd rather watch paint dry.